← What Can We Learn from the Yellow Vests? 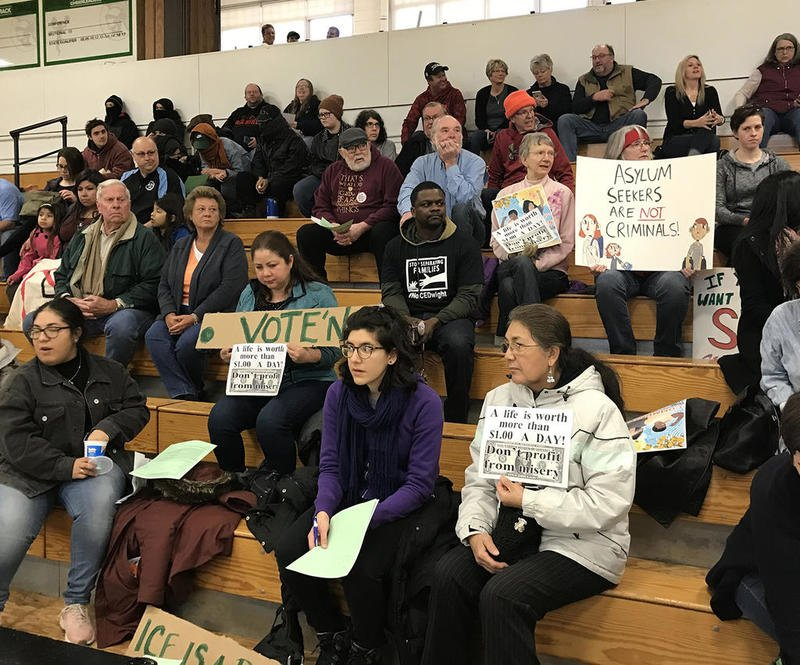 On March 11 the Dwight Village Board voted to move forward with the construction of a privately owned $20 million ICE detention facility on the edge of the town, which is 75 miles north of Champaign-Urbana. 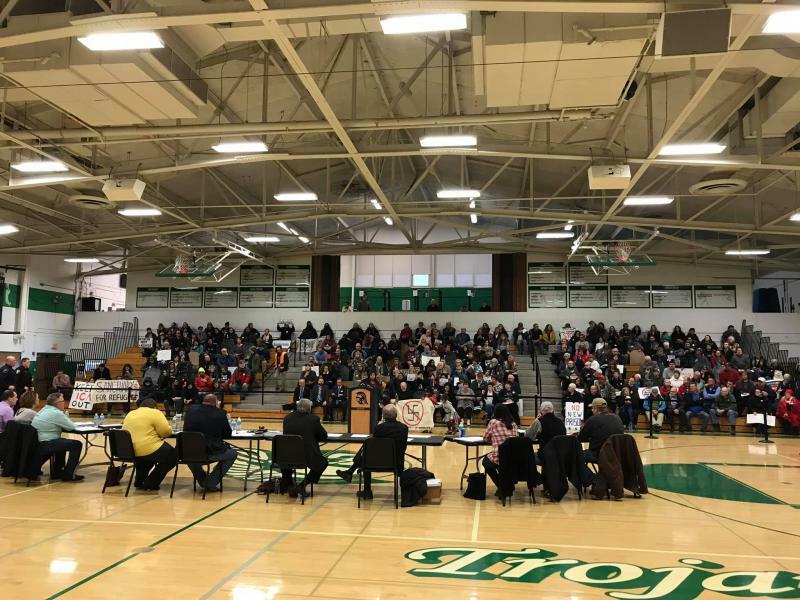 The tense meeting, moved to the high school gym to accommodate the crowd of 300, bristled with police brought in from nearby towns to control possible chaos. Three of us from CU FAIR (Champaign-Urbana Friends and Allies of Immigrants and Refugees) joined others from Peoria, Chicago and Indianapolis to express concern during the public forum. For two hours opponents questioned the use of detention for civil offenses, the place of private prisons in the justice system and the impact on families. A few supporters emphasized what appeared to be preordained talking points in arguing that outsiders should have no voice on this decision that could bring in much-needed local jobs and that immigration was a complex issue best left to D.C. decision makers. The debate turned between these two sides—one framing opposition to the facility primarily in moral terms, the other attempting to limit discussion to local economics. Perhaps the vote would have gone differently if the issue had been framed in terms of the threat that the security industry poses to American democracy. The pioneers and current giants of the for-profit prison industry are Core Civic (formerly Corrections Corporation of America, or CCA) and the GEO Group (previously Wackenhut), who both began managing public prisons in the 1980s. In the 1990s the mania for privatization of government services along with the Giuliani-esque turn to harsh sentencing as a social control strategy combined to create a lucrative new market in human incarceration. Between 1980 and 2013 the prison population in America more than doubled, while the federal prison population increased 800 percent, according to the U.S. Department of Justice (DOJ). Prison corporations controlled 10-15% of this human market but, despite industry claims, were neither more cost effective nor humane. In August, 2016 the DOJ announced it would be phasing out the use of private prisons in response to persistent problems with fraud, waste and unsafe detainee conditions, as well as a deep concern with the conflict of interest inherent in bringing for-profit enterprises into the justice system. The decision—since reversed by Trump—should have crippled the companies, but by this time the prison industry had located a new revenue stream in immigration detention. Creating a Product: the Criminalization of Immigration. In 1994, the average daily count for Immigration and Naturalization Service (INS) detainees in the U.S. was 5,000; by 2018 it had passed 44,000, according to the Defense Watch Network, 70% of whom were detained in for-profit prisons. These numbers don’t reflect an increase in unauthorized border crossings, however, but merely the expanded use of detention for what even ICE terms “non-criminal” violations. The first expansion of the detainee market followed the 1996 passage of the Illegal Immigration Reform and Immigrant Responsibility Act (IIRIRA), which fed the prison system by prescribing detention for civil immigration violations. Then, in 2003, the Homeland Security Act folded the INS into the new Department of Homeland Security as Immigration and Customs Enforcement (ICE), relegating migrants to the category of national security threats. 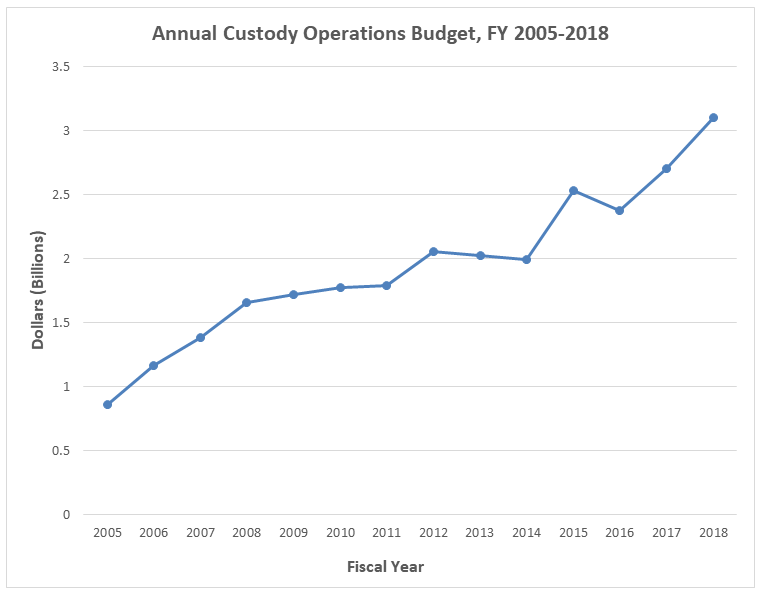 During the next decade zero tolerance policies, streamlined mass hearings and “detention bed quotas” created a demand for prison services in immigration detention. Corporations like CCA and GEO weren’t merely serving this growing market, they were actively involved in shaping both the legislation and the cultural narrative in ways that made it possible to incarcerate those without the correct documentation as if they were potential terrorists. They contribute to election campaigns, especially at the state level, and are directly involved in drafting the legislation they profit from through their participation in the American Legislative Exchange Council (ALEC). Typical of ALEC initiatives was the 2009 Arizona law, SB 1070, that essentially turned local entities into federal immigration police. Suddenly, having a tail light out on a car could land a peaceful, taxpaying, family breadwinner with an expired visa in detention as if they were a national security threat. 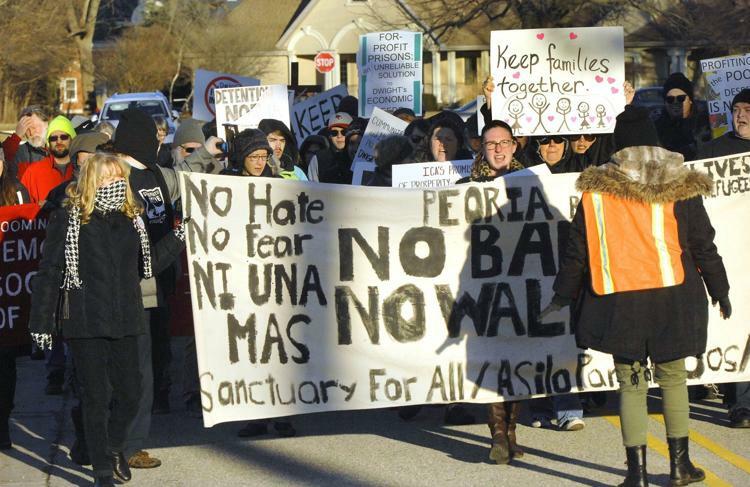 Immigrant Centers of America (ICA), the company that hopes to build in Dwight, is a relative latecomer to the field of for-profit prisons, but they identified the new market for detention far from the southern border and in 2008 opened their first facility in Virginia. In 2017 ICA proposed a 1200-bed facility in Goshen, Indiana, but rescinded the proposal in July, 2018 after confronting community opposition. Dwight, with its struggle to create new jobs for its youth and former employees of the closed prison, appeared to be an easier target. Alternatives to detention for those awaiting immigration hearings do exist and have been highly effective, according to the American Civil Liberties Union. These methods include self-reporting (which costs about $4 a day), electronic surveillance (about $30 a day), and case management. Case management is the most expensive of these at about $45 a day for a family, but has a 99% success rate of clients appearing for scheduled ICE appointments. In contrast, detention in a for-profit prison costs taxpayers about $150 a day for individuals, and over $300 a day per person for those in family detention facilities. Worries about the growth of these alternatives to detention led the GEO Group to diversify into GEO Care (a case management service) and BI Technologies (electronic monitoring for ICE), but their worries never materialized. Despite the low cost and high success rate, Trump eliminated funding for the family case management program in 2017. In their quest to create a market for detention services, prison corporations have stoked perceptions of a national security crisis. It’s the same strategy that other sectors of the security industry (police training, defense contractors, personal weapons and protective gear, metal detectors, home security systems …) have employed to sell products, and it’s the same strategy that worked well for Trump in the 2016 election and its aftermath. But this strategy of “securitization” has tragic costs for American democracy. It short-circuits debate on many topics by relegating issues to the realm of emergency procedures and expert management. Unfortunately, the experts charged with resolving securitized subjects are all too often those with a financial stake in the policies designed. It’s been decades since Eisenhower warned Americans of the threat the military-industrial complex posed to democratic government, but even he might not have expected the overwhelming success the security industry has had in convincing Americans of the need to cage children or install metal detectors in elementary schools. The creation of the sense of a national crisis handled through incarceration, weaponization, and barrier enforcement is directly linked to the rise of the private security and private prison industry. As many speakers at Dwight noted, the moral and practical challenge of how we as a nation will respond to global changes in human movement is indeed a complex issue, but the way immigration has been folded into the security industry in an effort to place detention beyond debate is clear: it is profit hidden behind the politics of fear. This entry was posted in Immigration, incarceration. Bookmark the permalink.